Dan Zehr recently asked patrons of Coffee With Kenobi, “What makes stormtroopers so cool?” He asked his question in conjunction with a giveaway of 99 Stormtroopers Join the Empire by Greg Stones. I answered with a few of my observations about stormtroopers, but the question got me thinking about stormtroopers in general. Stormtroopers are indeed popular. Go to almost any comic convention, and you will find the 501st Legion, the costuming group featuring the Empire that raises money for charity. Many, if not most, of the 501st’s members costume themselves in the white armor of the stormtroopers. Fans flock to get their picture taken with the stormtroopers. So, what it is about stormtroopers? What is the public perception of them? Why are they so popular. Here are some of my own thoughts on the subject. My earliest memories of stormtroopers are from A New Hope. I was a young child when George Lucas and Fox released A New Hope, simply title Star Wars in those days. Before The Empire Strikes Back arrived in theaters, I remember speculating and debating what exactly stormtroopers were and where they came from. My friends and I thought they were perhaps droids. That theory sprung from the multiple droids, which we just called robots, that populated the films. In addition, audiences didn’t see stormtroopers faces. Granted, if we thought a bit harder about it, we probably would have concluded they weren’t droids because Luke and Han donned the armor and disguised themselves as stormtroopers when invaded the Death Star. However, that is the logic of six and seven-year-olds. The history of the stormtrooper became clearer with each passing decade. With the introduction of the prequels, audiences learned that clones were the immediate predecessors to stormtroopers, and some of the earliest stormtroopers probably were clones. Once the sequel trilogy arrived in theaters, Finn introduced fans to the notion that stormtroopers were somewhat like Jedi. Taken from their families at an early age, the First Order indoctrinated stormtroopers in the dogma of their order. Fans often criticize stormtroopers for ineffectiveness in battle. For instance, the aim of the average stormtrooper comes under scrutiny. In addition, some fans question the effectiveness of the average stormtrooper after Ewoks defeated them on the Battle of Endor. Both are valid observations and critiques. However, fans should also remember the opening moments of A New Hope. When the Empire cpatures Leia’s ship, the Tantive IV, stormtroopers boarded the ship and launched a vicious, lightning fast attack. The stormtroopers mowed the Rebels aboard down with efficiency. Also, some of the criticism of the stormtroopers’ accuracy is attributable to strategy. When Leia, Han, and Luke fled the Death Star, they didn’t know Darth Vader had a tracking device stowed aboard the Millennium Falcon. He wanted to know where the Rebel base was. Leia acknowledges the Empire let them get away in response to Han’s bravado. However, Leia only figured this out once the Falcon defeated the TIE fighters in pursuit. Therefore, some of the stormtroopers’ inaccuracy may be attributed to Vader wanting the Rebels to believe they got away without tipping them off that they were being tracked. With each new film in the Star Wars saga, new flavors of stormtroopers are introduced. The Empire Strikes Back introduced audiences to the snowtrooper. The cold weather version of the stormtrooper arrived with the AT-ATs (also an incredibly cool Star Wars icon) to attack the Rebels on Hoth. Then, Return of the Jedi debuted the scout trooper. Like the snowtroopers, the scout trooper also had an amazing ride: the speeder bike. 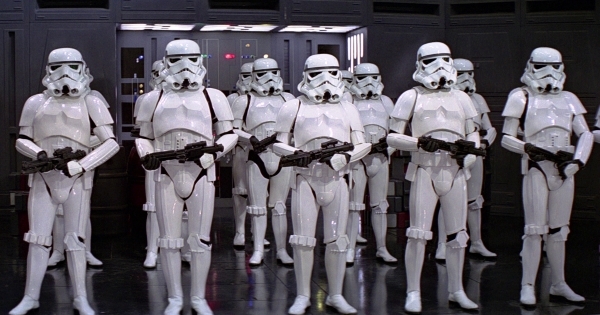 Although technically not stormtroopers, the prequels featured the clone troopers. The clones bore a striking resemblance to the stormtrooper with their white head-to-toe armor, tinted visors, and black rifles. Between Attack of the Clones and Revenge of the Sith, all manner of specialized clones. Furthermore, the clones were personalized by the popular The Clone Wars animated television show. Finally, a new era of Star Wars movies began with the acquisition of Lucasfilm by the Disney Company. With each new movie, more stormtrooper variety appeared. The Force Awakens arrived in theaters and debuted another brand of stormtrooper. The First Order stormtrooper is remarkably similar to the classic stormtrooper, but it includes enough updates to mark the passage of time and innovations of military technology. The film also introduced flametroopers and riot control stormtroopers. Rogue One took a step back in time to the days before A New Hope, but introduced the shoretrooper, Imperial assault tank commanders, and other varieties of troopers. Most notorious of all are Director Krennic’s death troopers. Stormtroopers are like ice cream. There is a flavor or variety for every taste now. Despite all of this, why exactly stormtroopers are so appealing to fans is hard to precisely explain. Perhaps it is the fact that they wear armor. With the armor, they remind audiences of the fantasy elements of Star Wars. Also, anyone can be a stormtrooper with a set of armor. You might not look much like Harrison Ford or Mark Hamill, but anyone can look like a stormtrooper. Plus, there are no shortage of them. Regardless, the stormtrooper is just as iconic when it comes to Star Wars as Darth Vader, the lightsaber, Yoda and other images. Thanks for reading. Contact me at dkeithly@coffeewithkenobi.com or on Twitter@DJKver2. You can also find me on my podcast: Starships, Sabers, and Scoundrels. Although I never have been a huge fan of the stormtroopers in any of their shapes or forms, Dennis, I agree with you — they certainly have their appeal. Perhaps it’s the mystique behind their helmets. We really don’t get to meet any of them until Finn takes off his helmet once the teams return to their ship after the assault on Jakku. There definitely is something to be said for creating a character that is faceless. Historically, there is the link between the stormtroopers of Star Wars and those of Nazi Germany. I don’t think the name George Lucas chose for the Imperial army was a coincidence. Interesting article, Dennis. I enjoyed it.